Sometimes things in your life show up at just the right time. I have been looking for a book recommended by a friend, It took me a month to track down a copy – seems it is the most stolen title in the Chapter’s Stores – they can’t keep it on the shelves – strange. My friend said I should read it because it had references to Personality Type. I am always looking for patterns that support or confirm the theory of type – and frankly everywhere I go I see relationships and patterns – and try to see how they fit. I was so engrossed in the ‘doing’ of looking for the patterns in this little book of wisdom that I almost missed the key message. Sometimes things don’t fit – they just are. Of course a fish can’t whistle – it is not in its nature – I can’t whistle either, although I could learn – I choose not to because I choose just to be me. If my environment made it necessary for me to whistle – I would spend a lot of time not being me – and doing something I don’t like to do – just like being in the wrong job or marriage. Most of us spend a lot of time trying to learn to whistle. The name of the book is ‘the Tao if Pooh’, by Benjamin Hoff. Tao means the way, a way of being and doing, as I read this little gem of a book – of course I saw patterns and connections to the coaching work I do, and to Personality Type – there I was busily trying to fit the characters into one of the four temperaments – making notes in the margins, diagrams at the back of the book – then realized I was missing the point. Yes, there are references or similarities to Personality Type, but that was not the main point. There are many messages in the book, however the main message or theme is ‘just be’ – let things flow – don’t be attached to the outcome. Wow! Sounds like coaching… Go with the flow! This can seem somewhat irresponsible to those who like to have a plan, set goals and work hard, but Hoff explains to Pooh that in fact because we are so busy ‘doing’ – we are not always open to the possibilities that the universe is creating for us, we can’t see the forest for the trees – and that was what was happening to me – enter this little book. In my work, I encourage clients to get in touch with their authentic self – the being that came into the world hard wired to live a life of purpose. We are all so shaped by our culture, experience and environment – most of us have no idea who or what we really are. Hoff explains P’u, the concept of the uncarved block. “The essence of the principle of the Uncarved Block is that things in their original simplicity contain their own natural power, power that is easily spoiled and lost when that simplicity is changed. This phenomenon happens to all of us – imagine if we could just take back that power that exists within the uncarved block. What gifts could we bring to the world if we just allowed to ‘be’? Who was I being? Trying to mirror the success of others and following their pattern and their ‘reality’. I was so caught up in – ‘you should be doing or being this’ – that I almost missed the messages the ‘universe’ was sending me. I was not walking my talk, I was trying to be someone else, or something else. The work is not over – I continue to evolve. And So… I am now committed to doing nothing –the wisdom of Tao encourages openness and embracing ‘nothing’, just ‘being’ and not so busy ‘doing’. 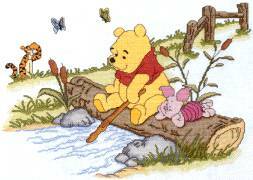 So what is Nothing according to Pooh? “It means just going along, listening to all the things you can’t hear, and not bothering.” In other words just being you. Embrace the uncarved block that arrived in the world with a gift to give – it is OK to be where you are, what you are doing – just be open to the possibilities. This entry was posted in Personality Dimensions, Personality Type, Temperament. Bookmark the permalink.